For thousands of years northern arctic natives have been perfecting kayaks specific for their area and needs. Frank Andrew spent 23 years in this traditional men’s house mastering the details of qayaq building and countless aspects of Yup’ik life. This classic institution was his Harvard. 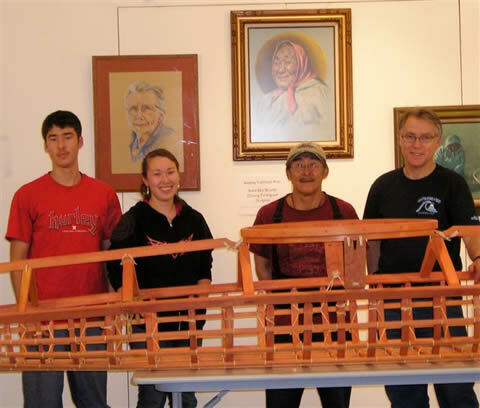 Frank was the only person in Kwigillingok, AK in the late 70’s that still owned and paddled a qayaq. Around 1989 Frank’s new son-in-law, Bill Wilkinson, was living in Tuntutuliak and working on a qayaq. On a visit to Kwig. Bill asked the revered elder about qayaq building. The student had found a teacher. In 2000 realizing the great gift Frank had given him, Bill and his wife Mary Ann bought lumber to build Qayanek, so new generations of builders could be trained. Many people helped and soon Frank’s son Noah could build kayaks. Frank Andrew Sr. passed away in 2006, and now his son and son-in-law have become the teachers. On the left Frank oversees Noah’s instruction to one of Frank’s grandsons. Another grandson Ethan WilkinSOn paddles a seal skin qayaq with one of Frank’s ancestral deck designs. 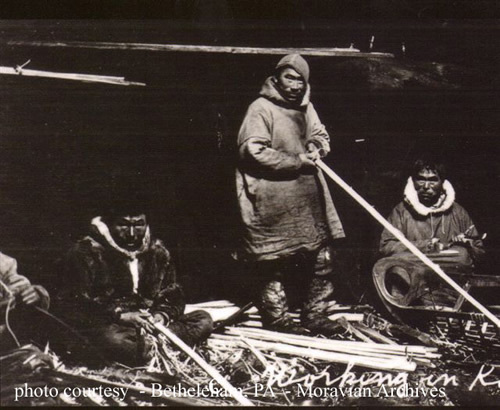 In 2007 Qayanek’s builders built another qayaq frame lashed with seal skin, pinned with spruce pegs, and painted with traditional crushed rock. This qayaq is displayed in the Anchorage Historical Museum. Franks grandsons and granddaughters are now learning ancient Yup’ik technology.